Sweden, 2009, 81 minutes, Colour. 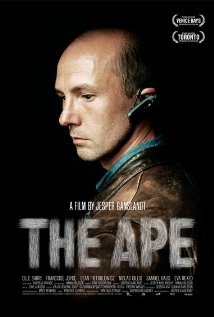 The Ape is a brief Swedish film, that draws its audience in (although those not on the wavelength may be bored and mystified). The focus is on a man who awakes in his home, sees a bloodstained body, washes his arms and hands, seems mystified – and then goes out and passes what seems to be an entirely normal day. He goes to work, conducts a driving lesson though he loses his temper, shops, sees his mother, plays tennis, has a shower, sees friends, finally going home and having to take his wounded son to the hospital. This is a picture of mental disintegration, a dichotomy between actions and normal life – with police glimpsed at the end when the wounded son whispers to his father that he has dreamed that everyone else is an animal except his father who is just himself. Irony of the violent man being apelike. 1. The dramatic impact of the film? Audiences introduced to a mysterious man? Following his day, unusual behaviour, the gradual revelation about him? 2. Swedish film, city locations, the house, the streets, shops, workplace, driving lesson, tennis game, showers, hospital, police? The musical score? 3. The title, the young son and his dreams about everyone being an animal except his father who is himself? Yet his fathers animal instincts and behaviour? 4. The opening, the man alone, the dead body and the blood? His looking, bewildered? Going out? The body? Listening only through headphones? Going to work, the driving lesson, his chat with the learner, his anger at her mistake, apology, getting out? His mother and the art? At the shop and the toy? Playing tennis, the shower, wanting the shampoo, the reaction of the man giving it? Conversations in passing on the street? The friend whom he hadn’t seen for some time? Going home, discovering his son, the blood, taking him to the hospital, his concern, the reassurance that the boy was all right, reassuring his son, the conversation about everyone in the dream being animals? 5. The reality of what he had done, slow, looking, not remembering, washing of the blood, the mental block, the dysfunctional behaviour, normal behaviour after such an event, some gradual realisations?